Shirkhodaei, M., Taghi Darzi, M., Haj Seyed Hadi, M. (2014). Influence of Vermicompost and Biostimulant on The growth and biomass of Coriander (Coriandrum sativum L.). 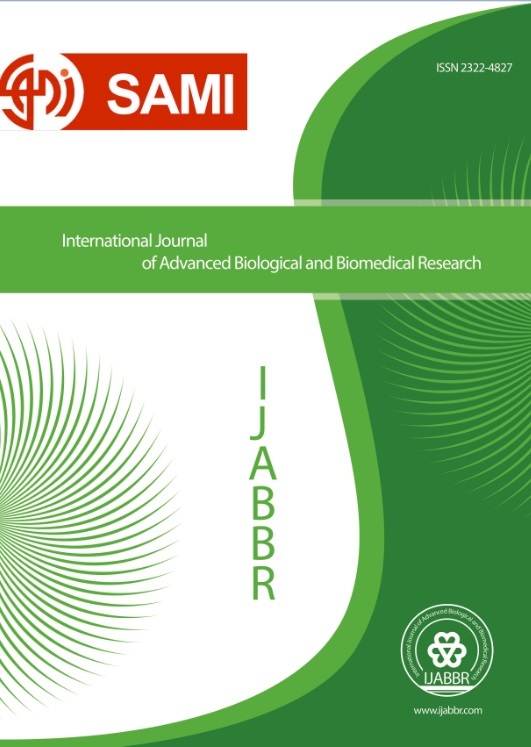 International Journal of Advanced Biological and Biomedical Research, 2(3), 706-714. Mahnaz Shirkhodaei; Mohammad Taghi Darzi; Mohammadreza Haj Seyed Hadi. "Influence of Vermicompost and Biostimulant on The growth and biomass of Coriander (Coriandrum sativum L.)". International Journal of Advanced Biological and Biomedical Research, 2, 3, 2014, 706-714. Shirkhodaei, M., Taghi Darzi, M., Haj Seyed Hadi, M. (2014). 'Influence of Vermicompost and Biostimulant on The growth and biomass of Coriander (Coriandrum sativum L.)', International Journal of Advanced Biological and Biomedical Research, 2(3), pp. 706-714. Shirkhodaei, M., Taghi Darzi, M., Haj Seyed Hadi, M. Influence of Vermicompost and Biostimulant on The growth and biomass of Coriander (Coriandrum sativum L.). International Journal of Advanced Biological and Biomedical Research, 2014; 2(3): 706-714. Anwar M, Patra DD, Chand S, Alpesh K, Naqvi AA, Khanuja SPS (2005). Effect of organic manures and inorganic fertilizer on growth, herb and oil yield, nutrient accumulation, and oil quality of French basil. Communications in Soil Science and Plant. Analys., 36 (13-14): 1737-1746. Arancon NQ, Edwards CA, Bierman P, Metzger JD, Lucht C (2005). Effects of vermicomposts produced from cattle manure, food waste and paper waste on the growth and yield of peppers in the field. Pedobiologia., 49(4): 297-306. Arancon NQ, Edwards CA, Lee S, Byrne R (2006). Effects of humic acids from vermicomposts on plant growth. European J. Soil Biology. 42: s65-s69. Atiyeh RM, Arancon N, Edwards CA, Metzger JD (2002). The influence of earthworm- processed pig manure on the growth and productivity of marigolds. Bioresource Technol., 81: 103-108. Azizi MF, Rezwanee MH, Khayat A, Lackzian H, Neamati (2008). The effect of different levels of vermicompost and irrigation on morphological properties and essential oil content of German chamomile (Matricaria recutita) C.V. Goral. Iranian Journal of Medicinal and Aromatic Plants. 24(1): 82-93. Badran FS, Safwat MS (2004). Response of fennel plants to organic manure and bio-fertilizers in replacement of chemical fertilization. Egyptian J. Agric. Res., 82(2): 247-256. Carrubba A, la Torre R, Di Prima A, Saiano F, Alonzo G (2002). Statistical analyses on the essential oil of Italian coriander (Coriandrum sativum L.) fruits of different ages and origins. Journal of Essential oil Research. 14(6): 389-396. Darzi MT, Ghalavand A, Rejali F, Sephidkon F (2007). Effects of Biofertilizers Application on yield and yield components in fennel (Foeniculum vulgare Mill.). Iran. J. Med. Aroma. Plants., 22(4): 276-292. Darzi MT (2012). Influence of organic fertilizer and biostimulant on the growth and biomass of dill (anethum graveolens). International Journal of Agriculture and Crop Sciences, 4(3): 98-102. Darzi MT, Haj Seyed Hadi MR (2012). Effects of the application of organic manure and biofertilizer on the fruit yield and yield components in Dill (Anethum graveolens).J. Medicinal Plants Res., 6(16): 3266-3271. Darzi MT, Haj Seyed Hadi MR, Rejali F (2012a). Effects of the application of vermicompost and phosphate solubilizing bacterium on the morphological traits and seed yield of anise (Pimpinella anisum L.). J. Medicinal Plants Res., 6(2): 215-219. Darzi MT, Haj Seyed Hadi MR, Rejali F (2012b). Effects of Cattle Manure and Biofertilizer Application on Biological Yield, Seed Yield and Essential oil in Coriander (Coriandrum sativum).Journal of Medicinal Plants, 9(11): 77-90. Diederichsen A (1996). Coriander: promoting the conservation and use of underutilized and neglected crops. International Plant Genetic Resources Institute, Rome, Italy. El Ghadban EAE, Shalan MN, Abdel Latif TAT (2006). Influence of biofertilizers on growth, volatile oil yieldand constituents of fennel (Foeniculum vulgare Mill.). Egyptian J. Agric. Res., 84(3), 977-992. Fallahi J, Koocheki A, Rezvani Moghaddam P (2008). Investigating the effects of organic fertilizer on quantity index and the amount essential oil and chamazulene in chamomile (Matricaria recutita).Agricultural Research: Water, Soil and Plant in Agriculture, 1(8): 157-168. Kalyanasundaram B, Kumar TS, Kumar S, Swaminathan V (2008). Effect of N, P, with biofertilizers and vermicompost on growth and physiological characteristics of sweet flag (Acorus calamus L.). Advances in Plant Sci. 21(1): 323-326. Koocheki A, Tabrizi L, Ghorbani R (2009). Effect of biofertilizers on agronomic and quality criteria of Hyssop (Hyssopus officinalis). Iranian J. Agron. Res., 6(1): 127-137. Kumar S, Choudhary GR, Chaudhari AC (2002). Effects of nitrogen and biofertilizers on the yield and quality of coriander (Coriandrum sativum L.). Ann. Agric. Res., 23(4): 634-637. Kumar TS, Swaminathan V, Kumar S (2009). Influence of nitrogen, phosphorus and biofertilizers on growth, yield and essential oil constituents in ratoon crop of davana (Artemisia pallens Wall.). Electronic J. Environ. Agric. Food Chemistry., 8(2): 86-95. Mafakheri S, Omidbaigi R, Sefidkon F, Rejali F (2011). Effects of biofertilizer application on some physiological, morphological factors and essential oil content in moldavian balm (Dracocephalum moldavica). Iranin Journal of Horticulture Sciences, 3(42): 245-254. Mahfouz SA, Sharaf Eldin MA (2007). Effect of mineral vs. biofertilizer on growth, yield, and essential oil content of fennel (Foeniculum vulgare Mill). International Agrophisics., 21(4): 361-366. Migahed HA, Ahmed AE, Abdel Ghany BF (2004). Effect of different bacterial strains as biofertilizer agents on growth, production and oil of Apium graveolens under calcareous soil. Arab Universities J. Agric. Sci., 12(2): 511-525. Moradi R, Rezvani Moghaddam P, Nasiri Mahallati M, Lakzian A (2010). The effect of application of organic and biological fertilizers on yield, yield components and essential oil of Foeniculum vulgare (Fennel). Iranian J. Agron. Res., 7(2): 625-635. Msaada K, Ben Taarit M, Hosni K, Hammami,M, Marzouk B. 2009. Regional and maturational effects on essential oils yields and composition of coriander (Coriandrum sativum L.) fruits. Scientia Horticulturae, 122:116-124. Saeid Nejad AH, Rezvani Moghaddam P (2011). Evaluation of compost, vermicompost and cattle manure application on yield, yield components and essential oil percent in cumin (Cuminum cyminum). J. Hortic. Sci., 24(2): 142-148. Sanchez GE, Carballo GC, Ramos GSR (2008). Influence of organic manures and biofertilizers on the quality of two Plantaginaceae: Plantago major L. and Plantago lanceolata L. Revista Cubana de Plantas Medicinales., 13(1): 12-15. SAS Ins (2001). SAS Institute, 2001. SAS Procedures Guide, Version 8. SAS Institute, Cary NC, USA. Singh B, Singh B, Masih MR, Choudhari RL (2009). Evaluation of P and S enriched organic manures and their effect on seed yield and quality of coriander (Coriandrum sativum). International J. Agric. Sci., 5(1): 18-20. Swaminathan V, Kumar TS, Sadasakthi A, Balasubramanian R (2008). Effect of nitrogen and phosphorus along with biofertilizers on growth, yield and physiological characteristics of Davana (Artemisia pallens Wall.). Advances in Plant Sci. 21(2): 693-695. Valadabadi SA, Farahani HA (2011). Investigation of biofertilizers influence on quantity and quality characteristics in Nigella sativa L. J. Hortic. Forestry., 3(3): 88-92. Velmurugan M, Chezhiyan N, Jawaharlal M (2008). Influence of organic manures and inorganic fertilizers on cured rhizome yield and quality of turmeric (Curcuma longa L.) cv. BSR-2. International J. Agric. Sci., 4(1): 142-145. Zaller JG (2007). Vermicompost as a substitute for peat in potting media: Effects on germination, biomass allocation, yields and fruit quality of three tomato varieties. Scientica Hortic., 112: 191-199. Zar JH (1996). Biostatistical Analysis. Prentice-Hall, Upper Saddle River, New Jersey.